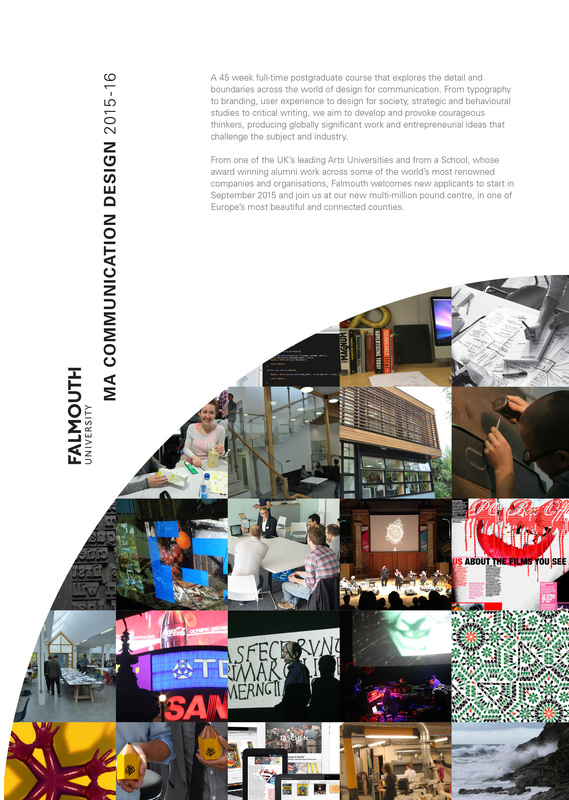 We are delighted to announce the launch of a new MA in Communication Design (*subject to validation November 2015). 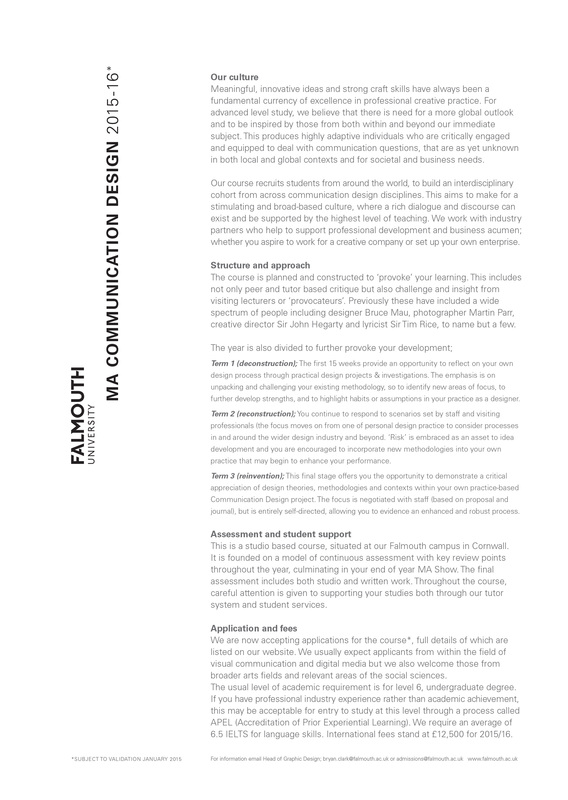 The new course builds on Falmouth’s considerable reputation for excellence in creative practice, proven by our alumni who work in some of the world’s leading design studios and agencies. Based at the UK’s Number 1 Arts University (Sunday Times League 2015) and in one of the most inspiring and beautiful counties in the country, the course will provide an opportunity for participants to challenge themselves and the subject, through exploration of themes and experiences that provoke change and innovation. The 45-week full-time postgraduate course starts in September 2016 and will examine the business, craft and boundaries of communication design. It will be based at our multi-million pound centre in Falmouth and is designed to engage students with issues, theories and the making of ideas centred on the contemporary development of the subject. You will be encouraged to evolve and grow your own ideas for future practice and business aims; examining this in the context of learning from the differences and similarities of global studio practice and gaining inspiration from those working at the forefront of communication art and design today. To facilitate this we will be working with award winning, creative provocateurs and tutors from across the world. This is a distinctive component to the course, as it allows us to examine more global questions that effect personal practice and emergent design cultures. We also invite provocateurs from beyond our immediate subject area, in other arts / science related fields, that seek to create and ignite new insights into the creative process. The course will also deliver its final show halfway through the last term, so to provide students with a period of critical reflection and review, which is different to many other postgraduate models. Importantly this allows students to take next steps to further their master’s project and personal development, within the actual time frame of their 45 weeks study. This may be through business planning and industry feedback, going on internships to support their new found direction or further testing, promoting and launching of work created. Head of Subject at Falmouth Bryan Clark notes; “We’re looking to recruit high calibre students to the course; curating a team of great thinkers who will have already graduated in a similar field more recently or have gained experience working in the creative industries and need to turn a new corner. From typography to branding, user experience to design for society, strategic and behavioural studies to critical writing, we want to develop and provoke courageous thinkers, producing globally significant work and entrepreneurial ideas”. Please contact Bryan Clark in the first instance to find out more about the course and applying for next September’s intake. For those thinking of doing the course, you will have a first degree in a related subject but equally we welcome enquiry from those with degrees in other design and arts fields or the social sciences (subject to interview and experience). Course Information sheet can be downloaded here. Applications for this course can be made in 2016.